Anyone who has been following my blog knows that I like to write about both Photography and Photoshop. Why? These two areas has become so intertwined that I consider them two-sides of the same coin. A Photoshop artist that knows about photography becomes a better Photoshop artist. A photographer that knows about Photoshop becomes a better photographer. Each field on their own can achieve “art”, but together they can create a “masterpiece”. It’s like a chef who does not taste their own recipes. The ingredients may be correct, but how they are blended makes all the difference. It seems obvious for a Photographer to learn Photoshop to perfect their “visions”. Photoshop can fix flaws, enhance images and create composites that would require expensive shoots. A Photographer can also plan shots for use in Photoshop. But, for a Photoshop artist to learn photography … that connection is not as clear. Grounded in reality, Photography is the art of capturing a subject in a moment of time. However, this is not true with Photoshop where you can literally create something out of nothing. Unfortunately, it doing so, many Photoshop artists loose the connection with the real world … Multiple light sources, drop shadows pointing in different directions, multiple perspectives, etc. A casual viewer may not be able to point out the error, but a casual viewer knows something is wrong. That subliminal message can lessen the impact of an image or an ad. Worse yet, it can turn into an embarrassment for you or your client. 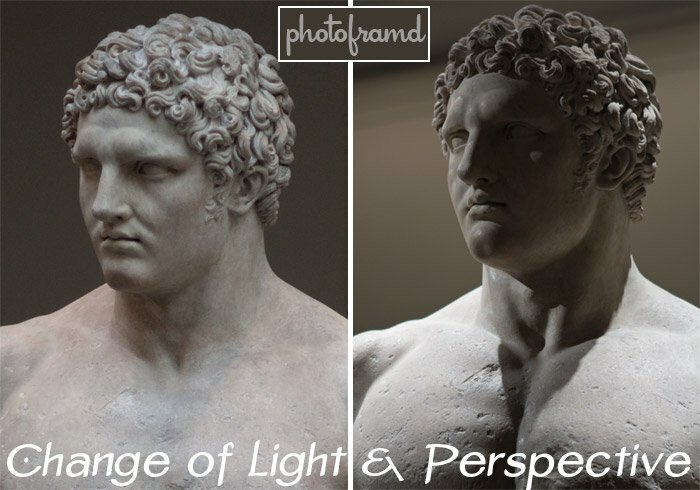 Light: how a light source hits an object to create highlights and shadows. Perspective: how a viewpoint can change perspective just by walking a couple feet in either direction. In the above photos, which ones have more of an impact? The ones on the right have better light and perspective. But, it’s the same with Photoshop. When Light and Perspective match, you are one BIG step closer to making a Photoshop composite that “feels right” and has impact! The easiest way to learn about Light and Perspective is to pick up a camera and start looking for the best shot. 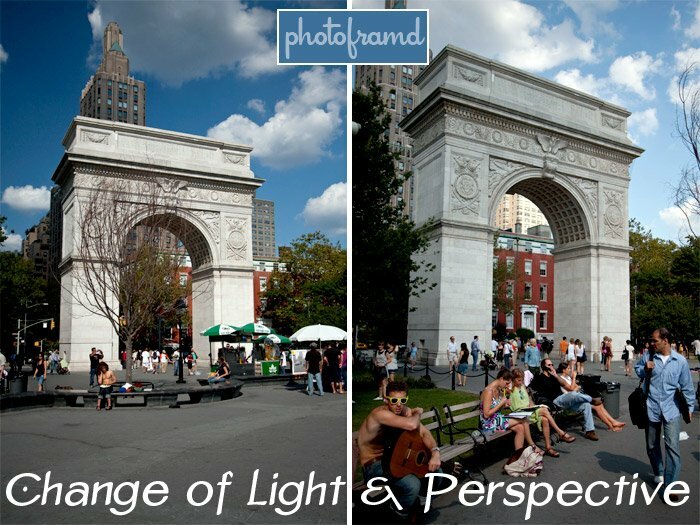 Training you “photographic eye” will helps you in Photoshop. And, chances are, you will have fun just doing it! ← Previous Previous post: PhotoPlus Expo 2009 is coming! Excellent analysis, I agree with you completely. Having 10+ years of photoshop, and a design degree, I can say that also greatly contributed to my knowledge of photography right from the start. Design and Photography go hand in hand, so if you’re a designer that doesn’t play around with cameras much, maybe you should think about trying it 🙂 You’ll love it, I promise. I can’t tell you how many new Art Directors think “adding a drop shadow” means to use Photoshop’s default settings and get a cup of coffee. Part laziness sure, but it really is a lack of real-world knowledge. I am very glad I took applied art courses BEFORE I learned Photoshop. It is an amazing program, but it needs the user to have an understanding of the real world … not just some keyboard short-cuts.